Every professional drywaller I’ve seen typically installs sheets of drywall horizontally, not vertically. The photo to the right shows what I mean. This guy is a friend of mine, Pete Paquet is his name, and he’s one of the best drywallers I know. I don’t think I’ve ever seen Pete hang drywall vertically except on short walls. 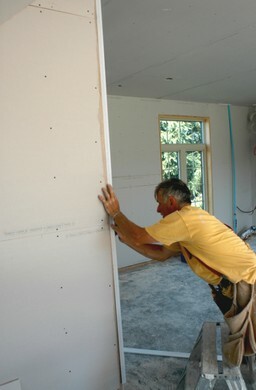 One advantage with the horizontal approach is that you can make use of long sheets of drywall to minimize the total length of joints that need to be taped. In addition to 8-foot sheets, 10- and 12-footers are also carried by building supply outlets everywhere. As long as you can get sheets of long drywall downstairs into the basement you’re working on, you might as well make use of them. Besides resulting in fewer joints, more of the total running feet of joint length will be four feet off the ground – the easiest height to cover in plaster and joint tape. Another advantage to horizontal installation is visual. For reasons that aren’t obvious, flaws in horizontal joints are more difficult to see than those in vertical joints.Another issue to consider is soundproofing your ceiling. I’ve written about this before and it’s especially important in a basement. By anchoring the ceiling drywall to strips of metal called ‘resilient channel’ (instead of to the ceiling joists directly), you’ll greatly enhance the sound resistance of the installation. Resilient channel isn’t expensive and it’s easy to install. Simply run it every 16 inches across your ceiling, anchored by screws driven into the joists, beginning near the outside walls. The drywall is secured with screws driven into the resilient channel only, not into the joists. You might find it interesting to know that drywall is used in places where you wouldn’t immediately think of the stuff. Venice, Italy, is a case in point. 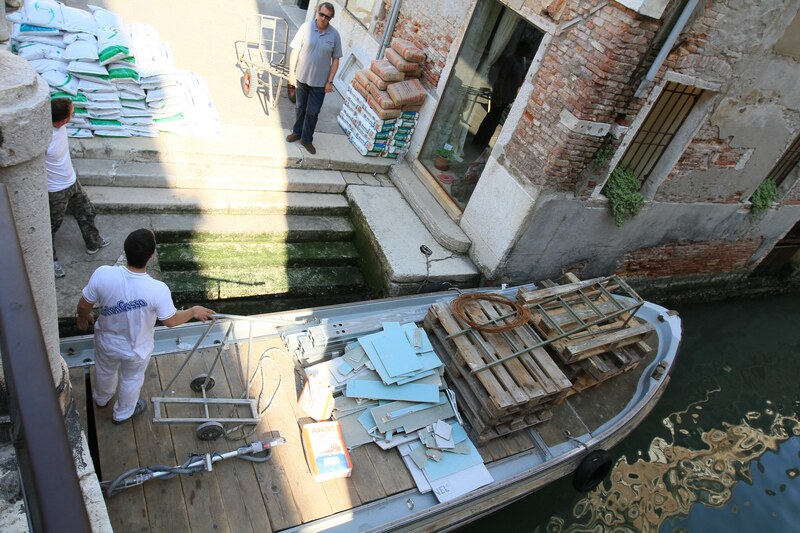 I took the photo to the left back in 2012 as a “work boat” pulled up to a Venetian home under renovation. It stands to reason that contractors would use boats instead of pickup trucks in a city with canals instead of roads. But just the same, it’s quite striking to see work happening with boars when you’re not used to it. You can see the drywall scraps on the deck of the boat. No discussion about basement drywall would be complete without warnings about moisture and mold. Even today many basements are finished in ways that promote mold and poor indoor air quality by using wood frame walls, fibre insulation and vapour barriers below grade. The problem stems from the fact that even though the basement environment is very different than above-ground spaces, most basements are not finished differently. The video below shows one basement finishing alternative that eliminates the tendency to grow mold.